Have you been feeling stressed for a long time? Do you have a hard time finding the right balance in order to manage stress properly? While having some stress can be beneficial, when it reaches long-term, harmful levels, detrimental consequences follow. The effects may range from weight gain to compromised immune function. In this current high-stress society, more and more people fail when it comes to managing stress properly. Because the body’s stress response is activated so often, our body doesn’t always have a chance to return to a balanced state, which results in a state of chronic stress. None of the hormones are allowed to work at optimal levels. Stress hits the adrenals, which either collapse in fatigue, fail to produce enough cortisol (functional thyroid deficiency) or overproduce it, causing overall hormone resistance. This article explains the role of the stress hormone cortisol, how it affects the body’s stress response and the factors that contribute to its overproduction, including recommendations on how to reduce cortisol. An important function of cortisol is to make the thyroid work more efficiently. Having an optimal amount of it, not too high and not too low, is crucial for normal thyroid function. Every cell in the body has receptors for both cortisol and thyroid hormones, and nearly every cellular process requires optimal functioning of the thyroid. So, when the levels are low, caused by adrenal exhaustion, the thyroid is less efficient at doing its job of increasing energy and metabolic activity. On the other hand, when the level is too high as a result of the adrenal gland’s response to excessive stressors, it causes the tissues to no longer respond to the thyroid hormone signal. It creates a condition of thyroid resistance, which means that the thyroid hormone levels can be normal, but tissues fail to respond efficiently to the thyroid signal. This resistance to the thyroid hormone signal, caused by high stress hormones, is not just restricted to thyroid hormone but applies to all other hormones such as insulin, progesterone, oestrogens, testosterone, and even cortisol itself. So, when cortisol gets too high, we start getting resistance from various hormone receptors and more hormones are required to create the same effect. High levels of stress hormones suppress the immune system, shutting it down to save energy so that it will be available to help the stress situation. Thus, when we are involved in a stress reaction, the body systems responsible for repair and regeneration are compromised. Because nothing is ever one-sided in life, here are both sides of cortisol: If we have too little cortisol (adrenal fatigue), we may suffer from fatigue, chronic fatigue, and exhaustion (See our blog on Adrenal Fatigue Syndrome). If our adrenal glands are producing too much cortisol, we may develop conditions such as weight gain, especially around the abdomen, depressed immune function with all of the consequences, accelerated aging and stomach ulcers. Problems arise when we are repeatedly [chronically] stressed, because our growth systems and immune systems are constricted or shut down. This is why we experience more sickness during periods of high stress, lose our clear thinking, and react automatically or instinctively. If we are repetitively under stress, it will take us much longer to heal, because that process isn’t a high priority item. Bear in mind that there are many other factors that can influence blood cortisol levels. Pregnant women and people using steroid medication or oral contraceptives may also have increased levels of cortisol. Though chronically low levels of cortisol are rare, they may indicate serious health problems. Make sure you seek the help of a medical professional if your cortisol level is low. 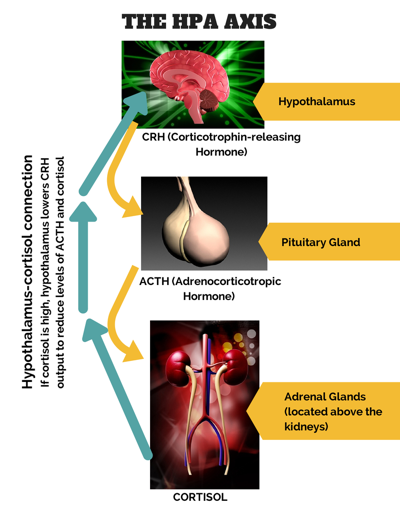 The HPA (hypothalamic-pituitary-adrenal) axis is a unique adaptive system that works by keeping the dynamic balance or equilibrium in a constantly changing environment. People who sacrifice sleep while consuming alcohol or caffeine can significantly alter their cortisol levels. Even lack of sleep itself can confuse and disrupt your HPA axis, causing a detrimental impact on your cortisol level. According to studies, decreasing your sleep from 8 hours to 6 per night can significantly increase your cortisol and insulin levels in just a week. Another factor that can raise your cortisol level is caffeine. Repeated intake of caffeine over a day can cause a marked increase in the level of cortisol, regardless of the person’s gender or the stressors involved. While the extent of the relationship has not been completely established, there is clearly a relationship that exists between cortisol release and caffeine intake, and this is worsened when stressors are involved. When combined with lack of sleep, it reinforces the bad effects of the stress response. Many people consume alcohol when under a stressful situation, usually in large quantities over a short period. This method of overcoming stress actually triggers the HPA axis to produce and release cortisol. Alcohol stimulates the HPA axis by suppressing the nerve cells responsible for inhibiting HPA activity. As a result, the HPA axis activity gets elevated. The bottom line is our common response to stress, such as caffeine intake, sleep deprivation and alcohol consumption, contribute to increasing the amount of stress hormones in our bodies, amplifying the very stress we try to combat. It’s best to learn how to reduce cortisol properly. Caffeine or alcohol consumption won’t alleviate the stress you are experiencing. Not even medications can provide a sustainable effect. Below are some of our recommendations on how to reduce cortisol using dietary and lifestyle changes. The first step for how to reduce cortisol level is to determine the specific stressor that triggers the release of cortisol. It could be an unhealthy work-life balance, lack of sleep or dieting. Avoid refined carbohydrates and sugar, which can evoke the stress response due to spikes in insulin production. Eat balanced meals that consist of complex carbohydrates, protein and healthy fats such as flax seed oil and olive oil. Eat at least 5 to 6 times per day, because cortisol starts to surge after 5 hours without food. Extreme dieting or restricting calories can take a toll on your HPA axis. Studies show that women who put too much mental energy into dietary restraint had high levels of cortisol, heightened sweet cravings, negative moods and higher fat levels despite exercising more. Exercise promotes the production of serotonin and dopamine – the ‘feel good’ brain chemicals that help reduce depression and anxiety. However, avoid prolonged physical activity and keep exercise to about an hour. After working out for an hour, your testosterone will start to decline while your cortisol will begin to rise. Improve your sleep pattern by getting to sleep before 10:30 pm. To help you fall asleep easily, avoid blue light emissions from laptops, TVs and iPads 2 hours prior to sleep. You can use natural sleeping aids such as chamomile tea. To help you wake up, use a light box that imitates sunrise rather than an irritating alarm clock. Caffeine from coffee, energy drinks, green tea, appetite suppressants and other medications can stimulate our adrenal glands, which results in an increase in cortisol production and disruption of sleep. Certain herbal medicines, such as guarana, yohimbe, and quebracho, also exhibit stimulant-effects. 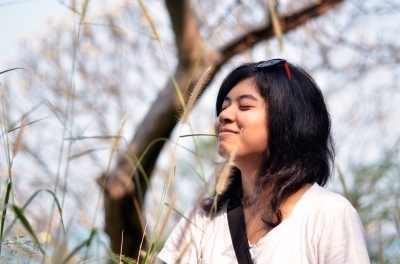 Another tip when it comes to managing stress is by doing this breathing technique. The Heart-Focused breathing exercise has been researched and developed by the HeartMath Institute USA. It helps to harmonise and synchronise your brain and your whole body with your heart. The result is a state called high coherence. In that state, your mind is calm, your body is relaxed, and your physiology switches to repairing, healing and nurturing mode. Just sit back; close your eyes; and start taking nice, deep, relaxed breaths. Direct all your attention to the area around your heart. Then, imagine that you are breathing in and out through your heart. Imagine that every breath in, your heart expands and every breath out, your heart contracts. Just keep your focus in your heart. Practice this heart-focused breathing for 5-10 min every day, before you go to sleep and just after you wake up in the morning. You will feel much more energised, focused and balanced throughout the day. The mind has the capacity to influence our immune system. Studies have revealed that humans are capable of ‘thinking’ their state of health into being, which also links to how they respond to stress. 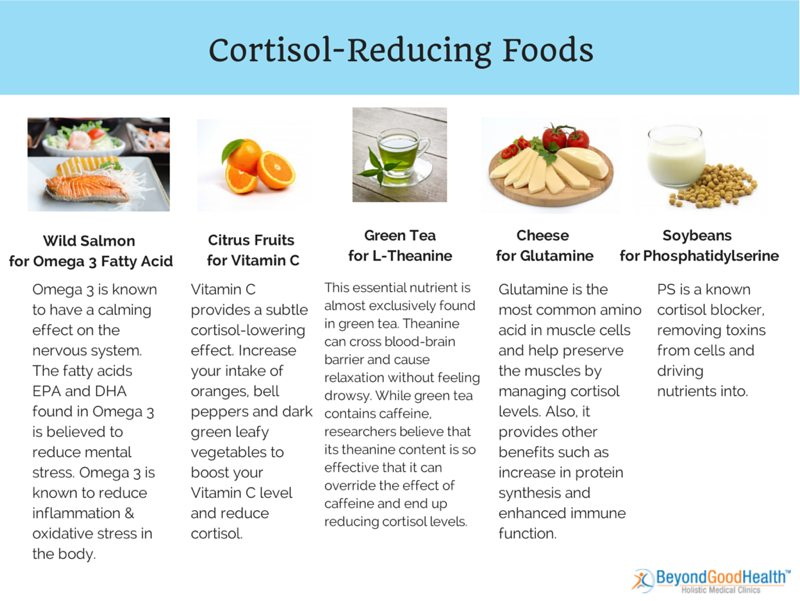 Understanding the science behind cortisol, including its biochemical behaviour and components, and the effects to the immune system is integral to battling fatigue, illness, stress and other health complaints. 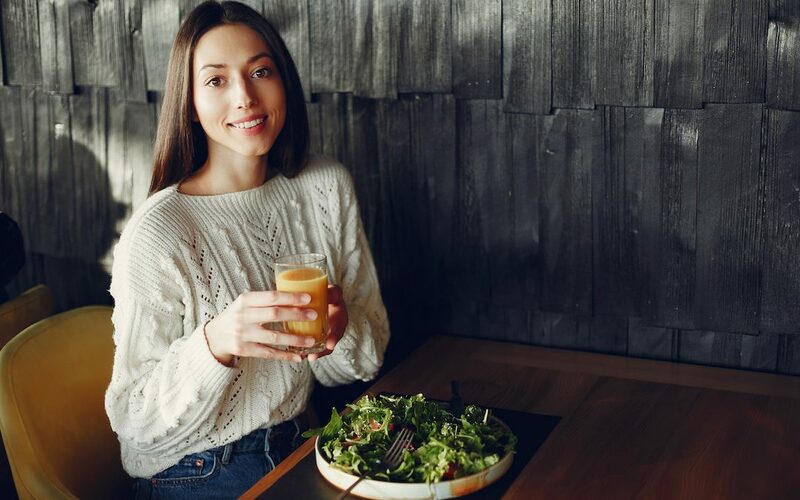 Having a targeted lifestyle and dietary approaches is a highly effective way of minimising inflammation, reducing stress and reducing the risk of getting diseases. The more we learn about how the body responds to stress , including its extraordinary innate healing power, the better you can improve health, increase longevity and inspire change. I trust these tips will certainly help you on how to reduce cortisol level, manage stress and harmonise your physiology. 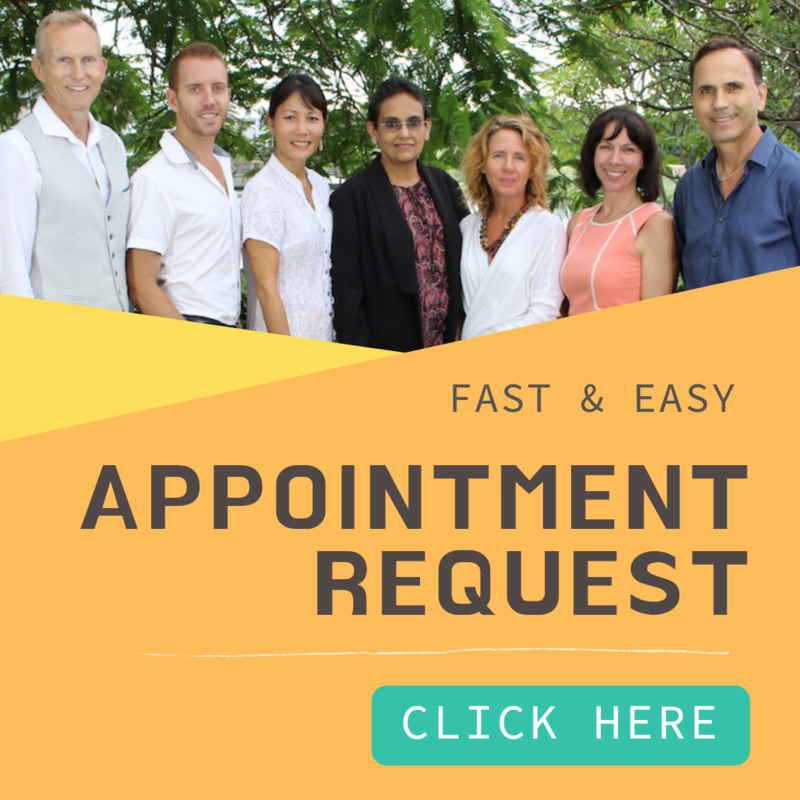 For extra tips and personalised support to help you tackle chronic stress and the health challenges that life is bringing you, I invite you to book a session with myself or one of our other experienced practitioners. Sign up for our newsletter with high-quality health and wellness tips.